Stretching from the Niagara Peninsula to Tobermory - with farmland, forests, and watersheds - the Greenbelt is a permanently protected living, breathing organism of green space, farmland, forests, wetlands, and watersheds. 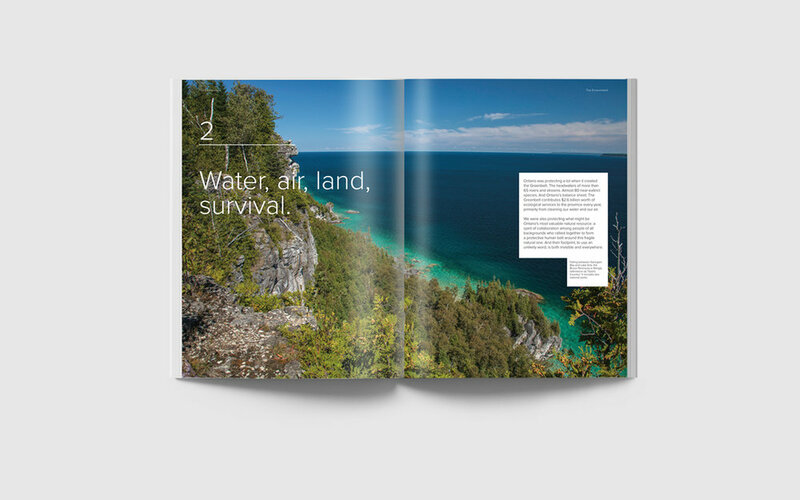 We were asked to design a book that celebrated not only the physical land, but the people who live in the Greenbelt—artists, farmers, entrepreneurs, cyclists, mountain climbers, and so many others who have been enriched by what makes the Greenbelt quintessentially Canadian. Like the Greenbelt, the book has vast open spaces with large colourful imagery and dense areas filled with informative interviews, research and anecdotes. The design is clean and layered with just the right amount of information, statistics and call-outs to engage the reader and not overwhelm them.